Bo turned 3 the last week in December and in trying to come up with a theme for his birthday, I thought about all the things that Bo loves. He loves puppies, so I first thought of The Pokey Little Puppy (links to Amazon are affiliate links). He loves animals and had been bringing me Tawny Scrawny Lion to read to him lately. So I was inspired to do a Little Golden Books birthday along with a fun unit study on Tawny Scrawny Lion. I did this unit with Malachi for preschool and had so much fun that I knew I wanted to do it with Bo. On Day 1 our focus was on Math and Colors. We counted the lion's ribs. Then, I counted Bo's ribs and tickled him. This is so much fun and brings lots of giggles. When we got to where the lion is full and the rabbits dance around him merrily singing songs, we sang "One little, two little, three little rabbits..."
We talked about what tawny means - a mixture of brown, yellow, and orange. Then we painted with brown, yellow, and orange to make the color tawny. And made a lion with the painting. On Day 2, our focus was Pretend Play and Days of the Week. I asked Bo what the lion chased on Monday? Tuesday? etc. He pointed to the animals in the book. And we sang the days of the week song. Sunday - Monday, Tuesday -Wednesday, Thursday - Friday, Sat ur day." We gathered up all the stuffed animals we could find from the story to act out the story. 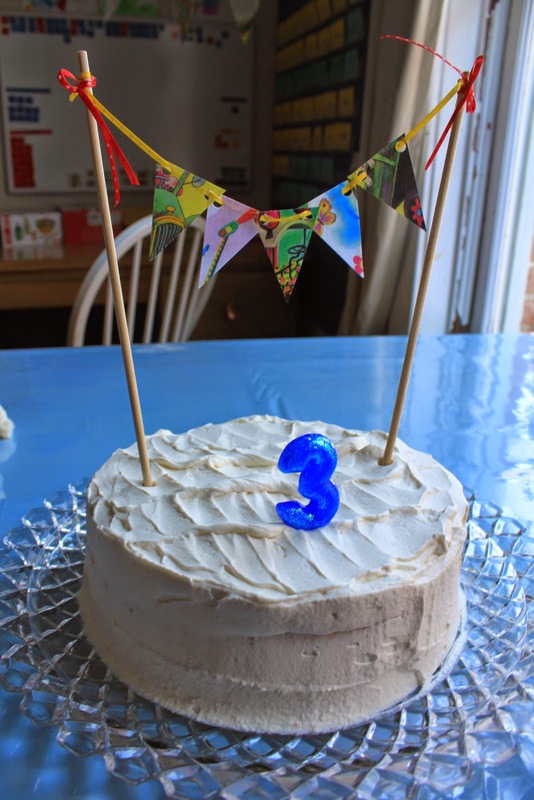 On Day 3, our focus was Cooking & Bo's 3rd Birthday! I made a Little Golden Books bunting. It was easy to find inspiration for a bunting, but instead of using book pages, I scanned and printed pages from books Bo loves, and then gave them a finish with Modge Podge. 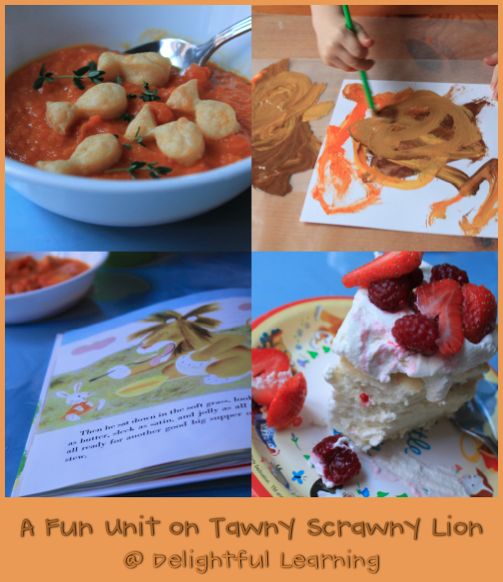 We read Tawny Scrawny Lion while we waited for crackers to bake. And of course, we made Creamy Carrot Stew and added fresh herbs and "fish." And berry punch to drink. He played with it at first, not sure he wanted to taste it. So, I read the page where the Tawny Lion eats another good big supper of carrot stew! The rabbits heap the Tawny Scrawny Lion's bowl with berries after he eats his stew, so we had berries for desert along with Bo's cake. Bo's angel food cake with whipped cream and berries. Yum! On Day 4, we made Pretend Carrot Soup and played kitchen. It was a fun week and a fun way to tie learning into Bo's 3rd birthday celebration! How you snuggle with me and still hold "nursie"
That you play very well by yourself and also with Elli and Mali. The cute way you say I love you - "I you." Or, "I you, too." How you tell me something, and I say, "Me too" in agreement, and you agree right back saying, "Me too!" as if I was the one who originally thought of it. This is really lovely. Where did you get the Golden Books plates and cups? Happy Birthday, Bo. Thank you, Phyllis! I ordered them at Birthday Express! Nooooooo! He can't be 3 already!!!!! 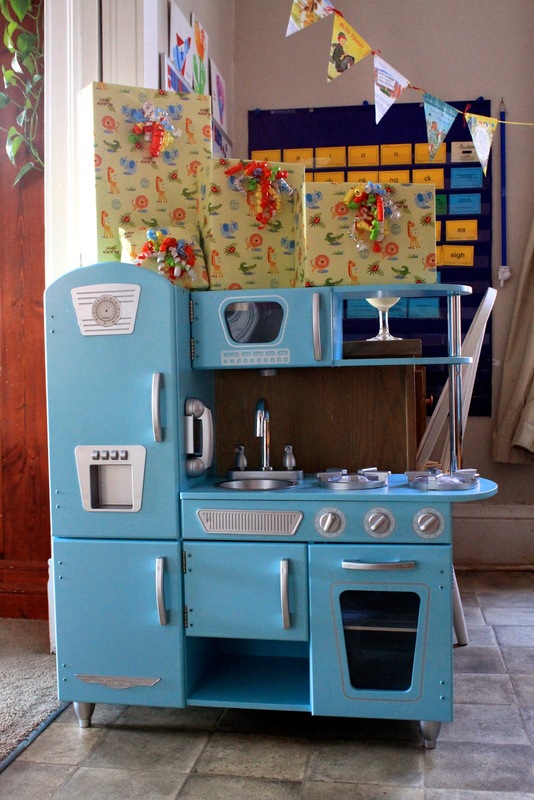 I kind of want to ply with that kitchen myself. It's gorgeous! What an amazing birthday party and an awesme learning experience. I really need this book and more little golden books :) This eally sounds like an awesome book...and I want to do all the things you did :) Aarya would be thrilled with that kitchen as well, he likes real as well as pretend cooking :) And that cake really does look Yumm! Thank you, Veens! It's fun creating memories for our children, isn't it! haha! I know. I can't believe it, either. Thanks, Erin! LOVE, LOVE, LOVE this!!!!! My kiddos brought down Tawny Scrawny Lion last week and asked if we could make carrot stew so we just changed dinner plans and did it. Next time they do that I'm going to use your inspiration and make a few days of it. Bo's cake looks delicious, I'm suddenly wishing I had a good angel food cake recipe. Thanks, Anna! Flea - so sweet! You know, I will have to listen to how Bo says it next time - I am surprised at how often I think he is saying it one way because I *understand* it that way.